Participants prepare to become founding fathers and mothers of freedom in the 21st Century! Don’t miss this amazing learning experience. There are no credits, grades, or credentials associated with this intense course of study—just great learning from the highest-quality materials and deep mentoring on the most important principles of freedom. No facades, just excellent learning. Each month you will receive several audios (usually two, sometimes as many as four or more – at the mentor’s discretion) specific to the course readings for that month. Course content is progressive, meaning that each month builds on the previous ones. You may join at any time. All who join this subscription will begin with Month One, and proceed with new mentoring content corresponding to the assignments each month through the program as described below. After completion of the Black Belt in Freedom sequence, subscription continues, and participants progress automatically into the subsequent Ambassador of Freedom Levels I and II (described below). This course includes an embedded online forum for participants, moderated by the TJEd Mentors. There is no other program like this in modern America. It is a detailed, intensive, founding fathers-style learning program. If you resonate with freedom—NOW is the time to prepare! Enroll now and go deep in freedom! 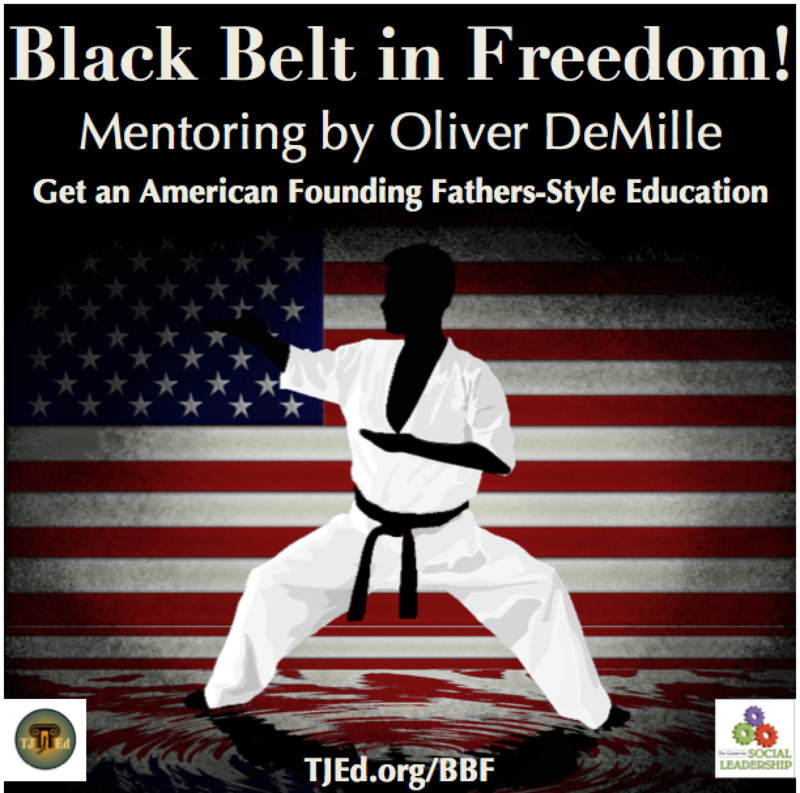 The Black Belt in Freedom is unique, powerful, and exactly what we need right now in our society. Schedule and complete a Final In-Person Examination of all studies, chaired by Oliver DeMille. The one-time fee for this examination is $600. Note that participants should only do the examination when they are well prepared. Of course, participants who know the material covered in these books without the help of the audios may take the examination without listening to them. Participants cover their own travel and housing costs associated with the examination. Those who do not pass the examination will be given an individualized study plan to complete before retaking the final exam. Get an American Founding Fathers style of education! A One-of-A-Kind Freedom Learning Program. Participants prepare to become founding fathers and mothers of freedom in the 21st Century! Don’t miss this amazing learning experience. As with the Black Belt in Freedom, there are no credits, grades, or academic credentials associated with this intense Ambassador of Freedom course of study—just great learning from the highest-quality materials and deep mentoring on the most important principles of freedom. No facades, just excellent learning. Participants must complete the Black Belt in Freedom before beginning, or pass the final exam to show equivalent preparation. This course is a direct continuation of the BBF program, and does not require new registration. This course is a direct continuation of the BBF program, and does not require new registration. Schedule and complete an in-person comprehensive final Oral Examination of all the materials from the Black Belt and also Workshops 1-10, chaired by Oliver DeMille. The one-time fee for this advanced examination is $900. Note that participants should only do the examination when they are well prepared. Participants cover their own travel and housing costs associated with the examination. Those who do not pass the examination will be given an individualized study plan to complete before retaking the oral exam. There are no credits, grades, or academic credentials associated with this intense course of study—just great learning from the highest-quality materials and deep mentoring on the most important principles of freedom. No facades, just excellent learning. PREREQUISITES: Participants must complete the Ambassador of Freedom 1st Degree Program before beginning, or pass the final exam to show equivalent knowledge. OPTIONAL: There is an additional fee for the Final In-Person Examination (see details below). Schedule and complete an in-person comprehensive final Oral Examination of all the materials from the Black Belt readings and Workshops 1-20. The exam will be chaired by Oliver DeMille. The one-time fee for this advanced examination is $1400. Note that participants should only do the examination when they are well prepared. Participants cover their own travel and housing costs associated with the examination. Those who do not pass the examination will be given an individualized study plan to complete before retaking the oral exam.